The setting of Jesus’ telling of the “Lost” parables is a familiar one. “Now the tax collectors and sinners were all drawing near to hear Him. And the Pharisees and the scribes grumbled, saying, ‘This man receives sinners and eats with them.’” Jesus’ mission to “to seek and to save the lost” (Luke 19:10) brought Him into constant conflict with Israel’s religious rulers, namely the Pharisees and scribes (Luke 5:30, 7:39, 19:7). Wherever Jesus went, a crowd of tax collectors, prostitutes, and general riffraff flocked to Him. This troubled the self-righteous Pharisees and scribes a great deal. However, our Savior was not ashamed to be known as, “a friend of tax collectors and sinners” (Luke 7:34). He willingly received them, even going so far as eating with them (Luke 5:31-32). The Pharisees and scribes were so hopelessly consumed with themselves; they had no time or desire to associate with sinners. Jesus knowing the Pharisee’s hearts, rebuked them with three parables that contrasted their self-righteous attitude with God (and Jesus’) tender compassion for the lost. The point of all three parables is that God does not sit passively by while the lost march onto hell. He has “no pleasure in the death of the wicked,” (ref. Ezekiel 33:11). Instead, He loves them, searches for them, pursues them, and longs for them to be saved. When even just one is found, God erupts in joyous celebration. The first two parables, the Lost Sheep (15:3-7) and the Lost Coin (15:8-10), share the same key point; when one sinner repents, God calls for a celebration in heaven (15:7, 10). He is the seeking shepherd whose desire it is to rescue the lost sheep. He is the homemaker who will stop at nothing to find a lost coin. And when they have found that which was lost they call together their friends and celebrate. The obvious application Jesus is making is, if you Pharisee and scribes would do this for a lone sheep or a lone coin, then why not for one lost soul, who is of greater value (cf. Matthew 10:6; 12:9-14). The third parable is the climax of His three illustrations. The parable of the Lost Son is more touching than the first two because it involves hurting humans and aching hearts, not dumb animals or inanimate coins. Although this parable goes into far greater detail than the previous two, it makes the exact same point. The loving father is God, who rejoices to see the homecoming of his lost son. The first half of the parable focuses on the shameful behavior of the son (15:11-16). The son asks for his inheritance, leaves home for a far country, where he wastes all his money on “prodigal living,” and ends up in near starvation. The middle section (15:14-24) revolves around the son’s repentance, his father’s gracious welcome, and the celebration that ensues for the return of the one that “was lost and now is found” (15:24, 32). It is in the third section of this parable (15:25-32) that an ugly twist is introduced in the form of the jealous older brother who reflected the attitude of the Pharisees and scribes. This jealous older brother would not go inside. He would not eat with his sinful brother or anyone who fellowshipped him, nor would he celebrate his sinful brother’s return. He totally lacked the compassion of the father in the parable and God the Father in heaven. Jesus demonstrates that the older brother, and by extension the Pharisees and scribes, are just as lost as any other sinner when the Father seeks out the older brother to “entreat” him to join in with the celebration (15:28b). The father’s plea, “it was fitting to celebrate and be glad,” is the exact point the Pharisees were missing, which is the real point of this parable. In their joyless hypocrisy the Pharisees refused to share the welcome that God loves to give lost sinners. All three of these parables share a common thread, a seeker finding what was lost and rejoicing at its being found. In every case, the unrelenting seeker is God, who upon finding that which was lost rejoices with joy inexpressible. This was the lesson the Pharisees and scribes needed to learn. Sinners are to be sought after, not silenced, or segregated. This is the lesson we must take to heart today. What prompted Jesus to tell the three “Lost” parables? Who is represented by each of the central characters and objects in each of the parables? According to the parables of the Lost Sheep and the Lost Coin, how does God respond when one of His valued creatures or treasures is lost? Use five adjectives to describe the joy that God expresses when that which was lost is found. Imagine yourself listening to these parables as one of the people the Pharisees called a “sinner.” What thoughts and feelings might you have experienced as Jesus talked? Let’s look more closely at the parable of the Lost Son. Describe the different ways the younger son brought shame to his family, especially his father. What does the father’s reception of his remorseful younger son reveal to you about our Father in heaven? 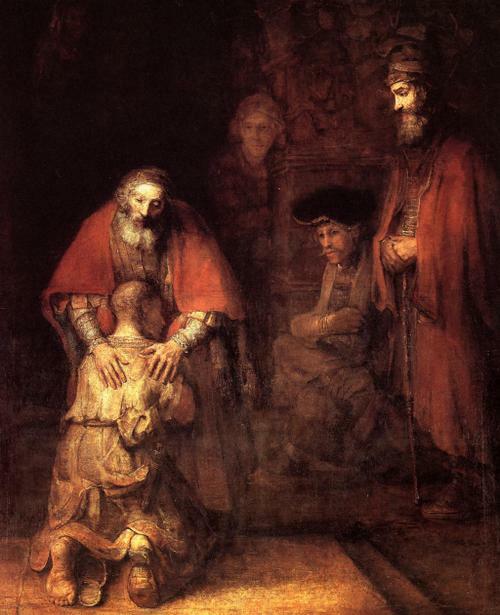 How can this portrait of God help you feel fully accepted and forgiven by your Father? Instead of ending the story with the celebration of the return of him that was lost, Jesus goes on to describe the reaction of the older son. What additional point do you think Jesus wants to make to the Jewish leaders, and why? In vs. 25-32 what is Jesus saying to His critics who scolded Him for receiving sinners? These three parables teach us that God receives sinners joyously. How has the message of the “Lost” Parables changed your perspective of the lost?